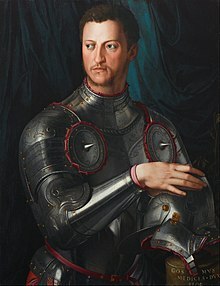 Cosimo I in Armour by Agnolo Bronzino. Cosimo I de' Medici (12 June 1519 – 21 April 1574) was Duke of Florence from 1537 to 1574 and then the first Medici Grand Duke of Tuscany from 1569. He was the son of Giovanni dalle Bande Nere and Maria Salviati. In 1539, he married Eleonora di Toledo (1522–1562). She died, with her sons Giovanni and Garzia, in 1562, aged forty. All three of them died from malaria while traveling to Pisa. Bia de' Medici (1536 – 1 March 1542) died in infancy. Maria de' Medici (3 April 1540 – 19 November 1557) died unmarried. Francesco I de' Medici, Grand Duke of Tuscany (25 March, 1541 – 19 October 1587) married Joanna of Austria and then Bianca Cappello. Isabella de' Medici (31 August 1542 – 16 July 1576) marrried Paolo Giordano I Orsini. Giovanni de' Medici (28 September 1543 – November 1562) Bishop of Pisa. Lucrezia de' Medici (7 June 1545 – 21 April 1561) married of Alfonso II d'Este, Duke of Ferrara. Pietro (Pedricco) (10 August 1546 – 10 June 1547) died in infancy. Garzia de' Medici (5 July 1547 – 12 December 1562) died unmarried. Antonio de' Medici (1548–1548) died in infancy. Ferdinando I de' Medici, Grand Duke of Tuscany (30 July 1549 – 17 February 1609) married Christina of Lorraine. Anna de' Medici (1553–1553) died in infancy. unnamed daughter (1566) died at birth? Virginia de' Medici (29 May 1568 – 15 January 1615) Cesare d'Este, Duke of Modena. This page was last changed on 22 December 2014, at 23:23.